Discussion in 'Mobile Tips/Plans and Internet Discussions' started by yomitech.com, Oct 9, 2016. Google search engine is now part of our daily lifestyle as most of us can't do without visiting it at least once a day. But many people don't know they can actually do more with the search engine aside the regular keyword search. Aside the usual internet search, the google search engine is packed with some other cool features like the Google calculator, language translator, currency converter and many more. It also has some hidden games, so anytime you feel bored, you can just type in some keywords and Start playing some cool games straight from your browser. In this post i will just list out five of the best games you can play straight from your Google search bar. 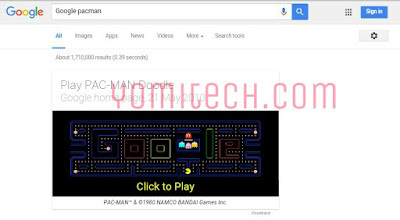 Google Pacman: If you want to play some old classic game where you have to navigate a yellow character to eat some little dots while being chased around by some ghost like characters then Google got you covered. 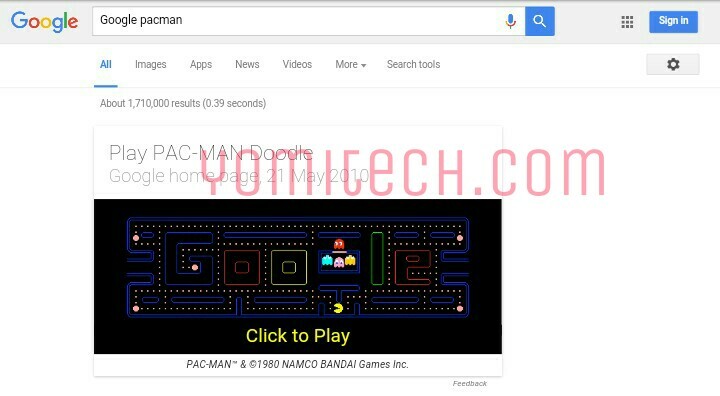 All you have to do is to open your Google search and type the word "Google pacman", click to play and you will be welcomed by a colourful screen almost immediately. Atari Breakout: This is actually an old game am pretty sure many of us must have played before. It involves breaking bricks with a ball while also making sure the ball doesn't land at the bottom by balancing it on a board. I really don't think my explanation can justify how interesting this game is. 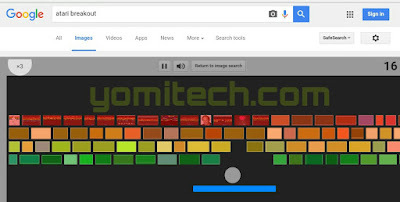 To check out this game, just type "Atari breakout" in Google image search and your browser will be transformed into a gaming screen in no time. 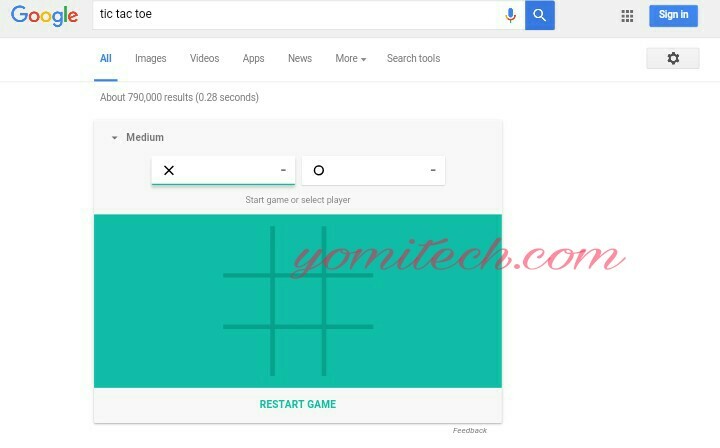 Tic Tac Toe: You might probably have played this game on your mobile phone before but now Google is making it possible for you to play it directly from the search page. 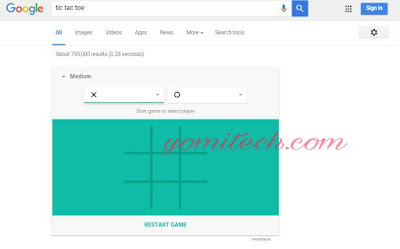 To play the game, type in the keyword "tic tac toe" in your search engine, select the difficulty level you want, choose a player and you can start playing the game. Solitaire: This is one game am pretty sure many of us are familiar with especially if you happen to be a windows PC User. 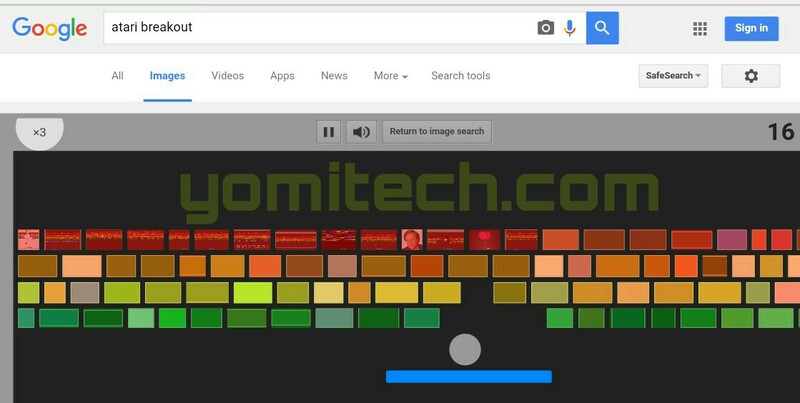 But you can now play the game on your Google search page irrespective of your current operating system. 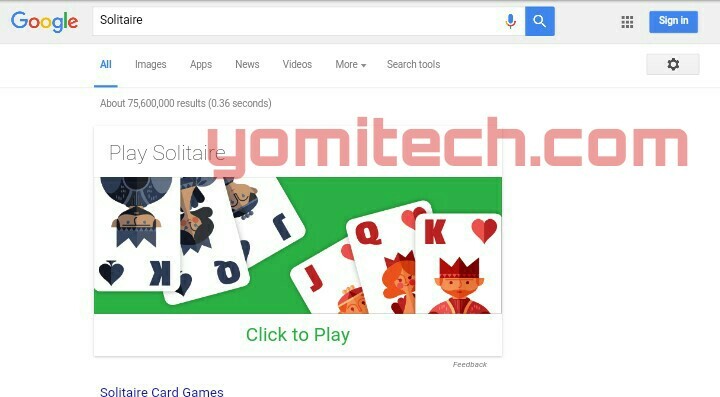 Just type in the keyword "Solitaire" in your Google search bar then click on the search button. Select "Click to play", choose your difficultly level and you can start playing. 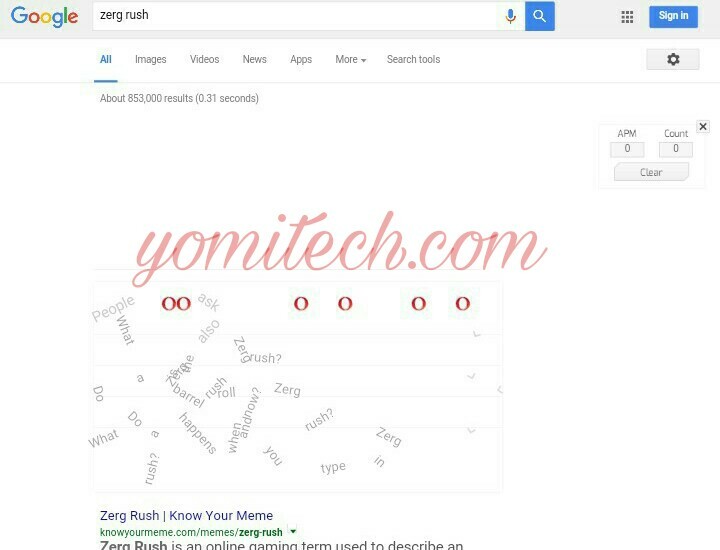 Zerg Rush: Unlike the other games i mentioned above, this particular game wouldn't take you to another page as you will have to play it directly on the Google search page. 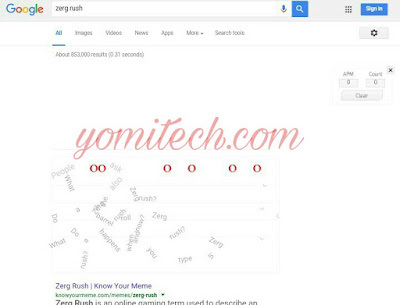 To play this game, Just type the keyword zerg rush in your Google search bar and hit the search button. But you might not be able to play this particular game on your mobile phone as you would need the mouse to play it. 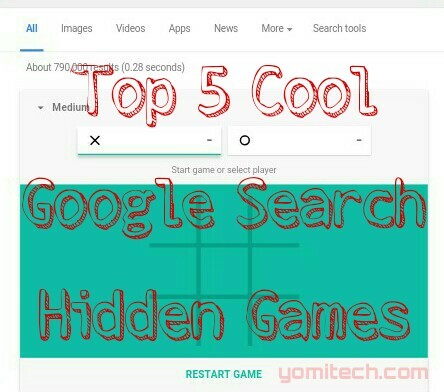 So guys those are five of the hidden games in the Google search engine to keep you busy anytime you are bored. If you know of any other one which I didn't mention then feel free to share it in the comment box below. But investors can get his/her 50, 000 earlier before the 2weeks if u refer any one. Turn your 0.002BTC into 16BTC in 30days using our unique 2*2 matrix and with downlines provided free of charge! Register first using the groups general link http://www.btcinvestments.co.za/ref/df60be7dc6/register and immediately pay your 0.002btc to your assigned sponsor. Level 1 - Upgrade with 0.002btc. 2 people are paired to you, you receive 0.004btc. Level 2 - Upgrade with 0.003btc. 4 people are paired to you, you receive 0.012btc. Level 3 - Upgrade with 0.01btc. 8 people are paired to you, you receive 0.08btc. Level 4 - Upgrade with 0.05btc. Finally level 5 - Upgrade with 0.5btc. 32 people are paired to you, you receive 16btc. What then are you waiting for? Remember, the future is BTC and BTC INVESTMENT is the only way.